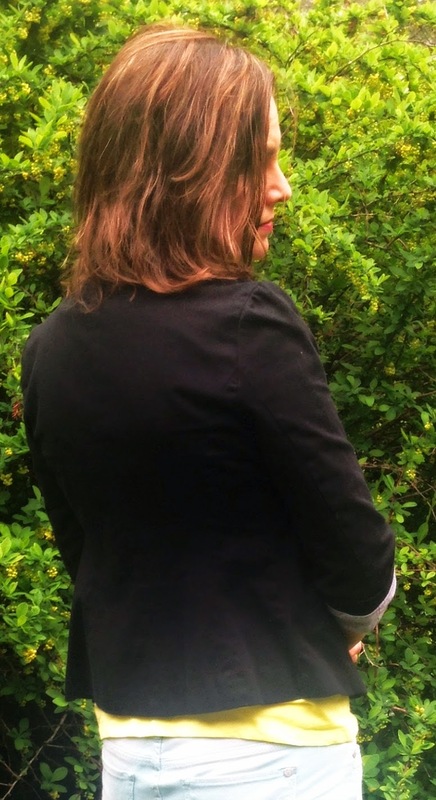 Ashley took a new spring graphic tee from J.C. Penney and mint skinny jeans (old, Kohls), and paired them with a black blazer (old, Express). I would never have considered putting bright spring colors with a dark, fall blazer, but Ashley said she did it because "Black is in the shirt". 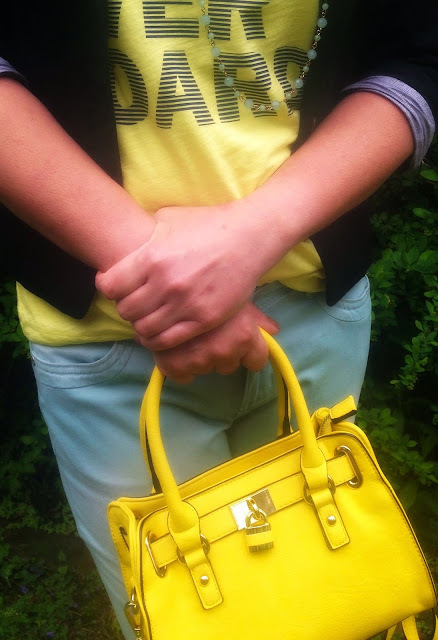 She then accessorized with my new yellow purse that she gave me for Mother's Day and a mint, long necklace. I added the black shoes to carry the color downwards and complete the outfit. Ashley bought the yellow purse at Charming Charlie's. I left the tee shirt un-tucked so it hangs out beneath the blazer. I love the sentiment and the little boat on this tee. I actually spotted this shirt on display and asked the sales associate where it was located in the store. It was just one of those items I was drawn to and had to have. I've never been on a sailboat in my life, but I love the sentiment and the summer colors. The sentiment pretty much sums up how I feel about life and fashion: Always Go Overboard…life is too short to not enjoy it to the fullest, and when it comes to fashion…well never be afraid to risks and break rules…especially when it comes to rules regarding age. My wedges I picked up on clearance at the end of last year at J.C. Penney. The design and material is perfect for warmer weather, yet, they provide the dark, black color if you need it in your spring/summer wardrobe. Yes, that's me, Always Going Overboard. I've been told that my house is 'over the top', that my yard 'looks like a park', that the musicals I've produced and directed were 'better than professional ones', that my parties would even 'intimidate Martha Stewart', etc, etc, etc, but I have always believed and always will, if you can't do it right, or at least give it everything you've got, then don't do it at all! Linking Up With: Casual Friday, Passion for Fashion, Fun Fashion Friday, Favorite Fashion Friday, and Charming Friday. LOL at "looking up at the sky like you're seeing an angel." I look at so many blogs that almost ALL poses are just normal to me now. 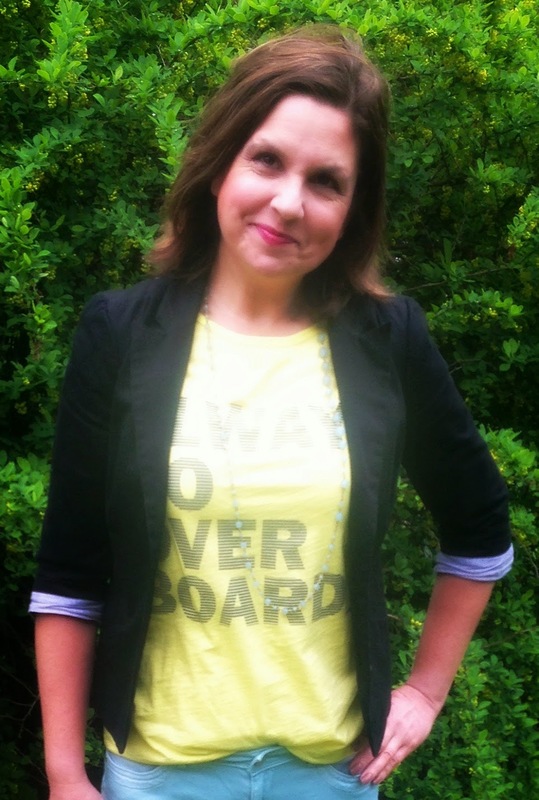 Love your fun, bright graphic tee! Cute outfit idea and tee. The struggle is real when it comes to poses, yours look great. What a cute way to style that adorable tee. Ashley did well suggesting the style. You look cute in each pose as well. It is ALWAYS a struggle finding the right pose. You look great, Amy! Such a cute graphic tee. Haha- I know I am guilty of the looking up in the sky pose. Since I do all my own photos, I generally do just anything, like looking around, as I am pushing my remote. It just so happens these tend to be some of my favorite pics. You look so cute looking up! Have a wonderful weekend! Thanks for posting to Charming Friday! Love your outfit Amy. Nice colour combination. Your daughter seems to have your fashion genes (and not jeans) really cool outfit and love those peep-toe shoes congrats! Hi Amy ! 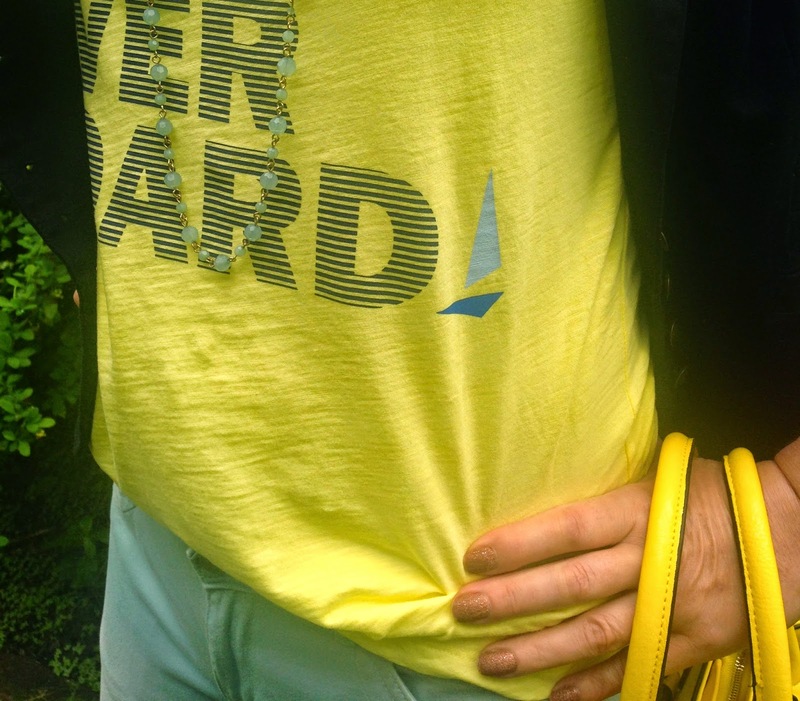 I believe one of the cutest outsfits you have shared :) Love the way the blazer brings out the black lettering on your yellow T.
Very cute and fun and I love the yellow bag! Thanks for sharing with Fun Fashion Friday & have a fun weekend!